Bumblebee is the 2018 entry into the long-running live action Transformers franchise from Hasbro that was first kicked off by Michael Bay in 2007. This film directed by Travis Knight (Kubo and the Two Strings) takes the origin story of the titular character and beloved Autobot back to the 1980s and many have heralded it as the Transformers movie many fans have waited for from the beginning. The film kicks off with an epic battle back on the Transformers’ home world of Cybertron, Optimus Prime, leader of the Autobots looks to be in serious trouble and he directs his young lieutenant Bumblebee to escape to their secret planet, Earth, to hide out and help establish their new headquarters. But Bumblebee arrives and is spotted by a military organization and hunted, then also tracked by his home world enemies the Decepticons. A fight ensues, his vocal synthesizer is torn out and he is badly injured and must power down, his memory chips failing. It’s 1987, and the teenage Charlie (Hailee Steinfeld) who has just celebrated her 18th birthday is looking for some independence from her mother and her stepfather. She discovers a dusty old VW Bug in the auto shop she passes through on her way back and forth from work and convinces her uncle (Len Cariou) to let her have it. She fixes it up and drives it home, only to have it come to life – it is Bumblebee hiding out from the Decepticons. She develops a deep connection and friendship with Bee, but his reactivation has alerted the Decepticons to his presence and the planet at large. Soon Charlie her neighbor who has a crush on her Memo (Jorge Lendeborg Jr.), and Bee will find themselves fighting for their lives and the life of the planet. Let’s start with the good parts of this film. Coming off of the last Transformers film, just about anything would be a welcome departure, and Bumblebee does the trick of cleansing the palette. At its core is the story of a friendship between a young woman and this young robot who both must grow and change together, Charlie who is dealing with the recent death of her father, and Bee who is dealing with the war raging on his planet, the loss of his voice and overcoming fear of humans. It’s a heartfelt story handled well by the director. The action sequences, apart from the opening scene on Cybertron are also easy to digest. They don’t overwhelm the brain with so much chaotic CGI that one can’t focus, a shortcoming of the many films in the franchise before this one. In the end, for a popcorn movie, Bumblebee does the trick and likely does satisfy the itch for those who grew up with Transformers in the ‘80s, and also easily sets up more sequels, but it’s also a quite forgettable film outside of the charming performance from the young and talented Haileee Steinfeld. Bumblebee was originally shot on the Arri Alexa Mini, Arri Alexa SXT, and Arri Alexa XT Studio cameras at 3.4K resolution with a 2K DI used in post-processing. The film comes to 4K Ultra HD framed at 1.85:1 in an HEVC 2160p (4K) encodement with Dolby Vision HDR. It’s a gorgeous transfer that has no issues clear to the eyes. The wide color gamut brings out the colors of the Transformers with a good amount of nuance, even the dusty mustard yellow of Bumblebee’s VW Bug. The wider contrast also grants wonderful ‘pop’ to highlights like muzzle fire and headlights and makes details in shadows stand out more. That said, the included Blu-ray is no slouch either. The colors aren’t quite as vibrant and the digital noise is a little ‘mushier’ to use a technical term, but it looks brilliant as well, with crisp details, strong colors, and inky blacks. 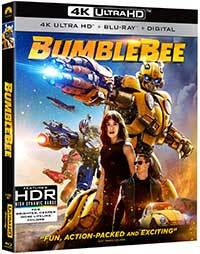 Bumblebee comes with a rollicking English Dolby Atmos mix on both the 4K Ultra HD and Blu-ray Discs included in this release. In keeping with Transformers tradition, the mix is aggressive with lots of solid sound effects panned everywhere and as very big low end. The dialogue is clean, but it can get a little lost during the chaos of the manic action sequences. The Atmos channels are usually active and add excellent height but are never used for any “voice of God” type sound effects. Bumblebee comes packed with special features including a comic book and motion comic, nearly twenty-minutes of deleted and extended scenes, ten minutes of outtakes, and a ‘making of’ that features behind-the-scenes footage and interviews. Hailee Steinfeld carries what is ultimately a forgettable — even if fun — action romp that has too many clichés and lazy sequences. The action is staggering and the best staged of all the Transformers films, and it comes across magnificently in this 4K Ultra HD with Dolby Vision and Atmos. This origin story for lovable Transformer Bumblebee goes back to 1987 where the Autobot is on the run, damaged, and hiding out in a rinky-dink auto shop in California when newly 18 Charlie (Hailee Steinfeld) discovers and repairs him, and the two form a bond that will become important to helping them save the world. A forgettable if heartfelt action flick that outdoes just about every other entry in the Transformers franchise, this one is helped along by the core friendship between Charlie and Bumblebee, an excellent performance by the young Steinfeld, and reined in action direction from Travis Knight. The 4K Ultra HD Combo Pack release reviewed here is oure home theater heaven.